March 22, 2013. Chris Clayton has advised Crumbs has been sold to Brian O'Rourke. Brian bought Chris' mooring with the boat so her home port will be the same. Chris has bought a 50' catamaran named Ohana to sail and charter in the South Pacific. Click here to check it out. We are standing by for Brian to check in. Crumbs is a fantastic yacht and we are very sad to see her go but need to sell having bought a much larger yacht to live aboard. Safe & sturdy in all conditions, she comes from a good design pedigree, is easy to sail & manoeuvre. She performs well for cruising or racing. An S&S 24 just like her sailed single-handed from NZ to France - that says it all! 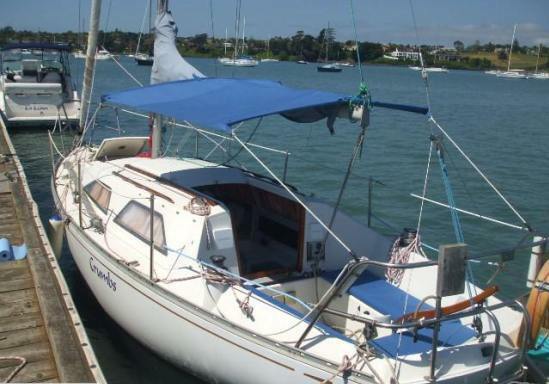 The mooring is optional (buy for $3000 or rent it short-term), ideally located very close downstream of Panmure Yacht & Boating Club where there are friendly, helpful people & great, cheap facilities. Haulout just $50! There's secure dinghy storage, all-tide jetty with dinghy ramps on the end & trolleys. The major difference setting Crumbs apart is her inboard diesel motor which gives the benefits of dependable push button start, economical running & charged batteries. New Solar panel - always plenty of power! Aluminium gas bottle and bracket. Diesel inboard engine 11hp Vetus, 100% reliable. New heat exchanger. New anode. many spares, charts, crew shirts etc! I'm an experienced skipper and have taught sailing professionally, happy to take the buyer for a day out sailing and teach you the basics. November 1, 2010. Chris checked in Crumbs, a Falcon 24 with the following email and pictures. 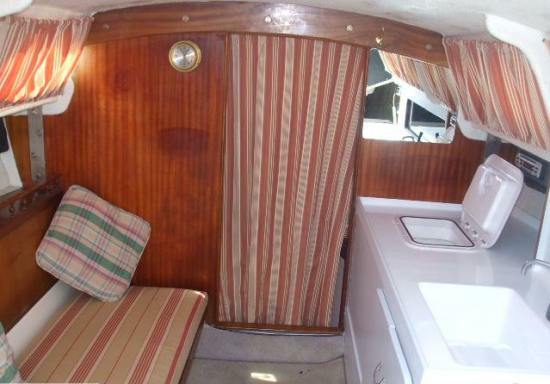 I have just bought a Falcon 24 called 'Crumbs' and will be keeping her on the Tamaki River in Auckland, NZ. I just wanted to check in with you as I noticed she is not on your list. She has been extremely well maintained by the previous owner and is fitted with an 11HP Vetus inboard, a great little boat. I have attached a few photos. Many thanks for your excellent, useful, informative and interesting site, it played a significant part in my decision to buy this yacht. For more information about these New Zealand built Falcon 24's and S&S 24's click here.